If you are like me and spend entirely too much time at Sephora, then you must sign-up to be a Sephora Beauty Insider. As you spend money, you build up points that can then be redeemed for small-size samples of products. On more than one occasion, I have found a new beloved product from a sample I received. My latest sample that has worked its way into my regular make-up rotation is Benefit CORALista. It’s a pressed powder blush in a shimmering coral color. Like other Benefit powder products, CORALista comes with a natural-bristle brush, but I still prefer to use my own blush brush. I like wearing this in combination with my LORAC TANtalizer Baked Bronzer. The Good: Benefit’s powder blushes and bronzers always have good pigmentation, and it is easy to achieve even, blended coverage. Even after wearing it all day in the Texas heat, this blush doesn’t ever look like it’s sitting noticeably on top of my skin. The Questionable: Due to the heavy pigmentation, this shade may be better suited for medium complexions. I think I’ll ask Wendy to try it on to see how it works with her fair complexion. CORALista does have a fragrance, which may not be everyone’s cup of tea. However, I like the scent – it’s light and fresh. 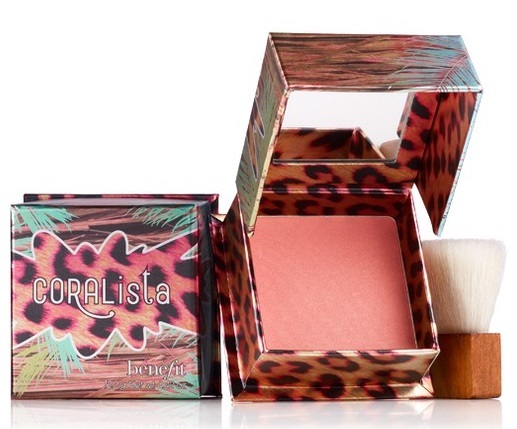 The Verdict: CORALista works great with my bronzer and is on trend for the summer* with its peachy overtones. I love it for now, but I’m not sure if it’s a color I will wear once fall/winter hits. Seeing as that may not be till December, I’ll most likely be wearing CORALista for a while. *AUTHOR’S NOTE: When you live in Texas, it feels like summer well through September and sometimes October, meaning I’ll be talking about wearing a summer make-up look for at least another month. This entry was posted in Vanity and tagged Benefit, blush, make-up, peach, Sephora, summer, top rated on September 4, 2011 by jenn. *Cough*…ahem…when do I get to try it out?